Vaping with this salt e liquid is going to be an interesting experience because the way these two flavors dance around your mouth to give you an amazing sensation. Before we even begin to explain this amazing flavor, it is cool to know that this is going to be a salt e liquid that is going to come in prefilled pods. 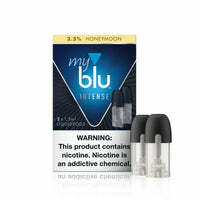 These pods are brought to us by the MyBlu INTENSE collection, which is going to be the group of differently flavored pods that are compatible with the MyBlu Device. Each of the pods is going to contain 1.5ml of salt e liquid, and seeing that each pack comes with two pods, this will mean you have 3ml of salt e liquid for you to enjoy for a long time. Now, when you take a pull of this salt e liquid, you are going to taste the creamy milk introducing itself. However, you cannot enjoy this blend without acknowledging the sweet honey flavor coming into the picture. The honey is going to taste rich and sweet. The way these two flavors dance around as they take you on a tasteful trip that is going to be like no other. You will eventually feel both of the flavors waltzing their way down your throat. Luck for you, the salt based nicotine is going to allow you to receive an amazing throat hit that is going to be incredible. The milk is going to get creamier and the honey is going to be more potent. It is going to probably begin to taste as if you are helping your self to an amazing bowl of cereal that has several flakes covered in some of the best honey that money can buy. When you exhale, the flavors are going to say goodbye by leaving you with a bit of an aftertaste, but nothing that is going to linger for long. The clouds are going to smoothly exit and the allow you to enjoy their small aromatic scent.